The well known path from Honister Hause towards Great Gable is known as Moses Trod: a trod being a path and Moses being a legendary quarryman, smuggler and illicit still owner. 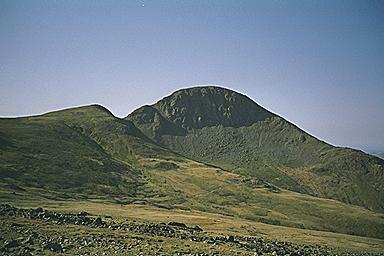 The formidable Gable Crag, the North Face of Great Gable, is left well alone by walkers. Green Gable appears to the left. Larger version of this picture.